Jacob Euteneuer is a PhD candidate at Oklahoma State University. His research focuses on new media, game studies, visual rhetoric, and multimodal composition. When he’s not reading, writing or teaching, he’s usually playing Mario with his wife and two sons. We often talk about emotions in terms of a spectrum. Certain films, games, and other cultural texts are said to run the gamut of the emotional spectrum, making us laugh and cry. But very few analyses or explanations actually go beyond the binary oscillation of happy/sad to look at the full range of emotions on display in a particular work of art. 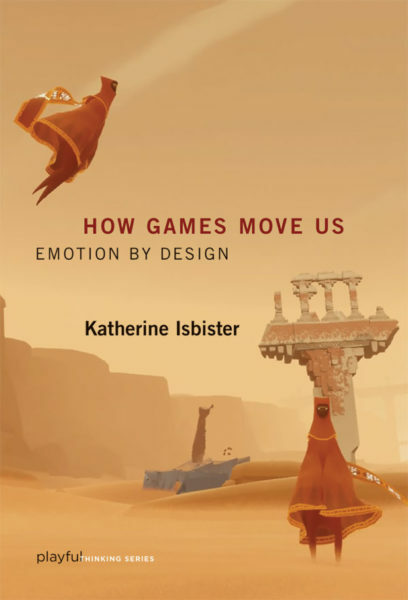 Katherine Isbister seeks to identify both the emotions at play in games and how designers can seek to achieve them in her book How Games Moves Us: Emotion by Design. Instead of targeting the commonsensical notions of games making players angry or joyful, she looks at social emotions such as pride, guilt, and complicity to understand the special power of games. As part of the MIT Press Playful Thinking Series, How Games Move Us seeks to further and expand the conversation surrounding videogames in our culture. Isbister attempts to achieve this by examining both the emotions elicited from playing games as well as how developers can and have gone about designing for emotions. Isbister seeks to elevate the conversation around video games by breaking down the monolith of “video games” into dissectable and intelligible parts. Rather than blanket statements of “games increase aggression” or “games help children learn,” she focuses on the particulars of specific games and goes further by highlighting individual elements and mechanics from singular games. She states in her introduction that her primary goal in the book is to show “that games can actually play a powerful role in creating empathy and other strong, positive emotional experiences” (xvii). In deconstructing the monolithic nature ways in which mainstream media depicts and covers video games, Isbister analyzes the effect of avatars, social play, bodily movement, and social connectedness and how they influence affect and emotion in players. Choice and flow become the defining characteristics of video games in Isbister’s analysis, and she continually refers to these concepts along with a mix of quantitative and qualitative data to reinforce her points. Early in the book, she argues that the act of play is more rewarding than the act of watching and cites studies using fMRI to investigate brain activity. She states, “[i]nteracting with the game shifted the emotional patterns observed in the players’ brains, demonstrating how we human beings experience particular rewards and emotions from the act of playing” (3). After identifying the key characteristics of the medium, Isbister builds on the opportunities afforded by choice and flow to study how game mechanics affect the player’s mind and mood. She looks at avatars, non playable characters (NPCs), and character customization in order to gain a theoretical understanding of how players project identity and shift emotional states through gameplay. Part of the power of Isbister’s book comes through the way she not only identifies sites of potential emotion building, but also provides an in-depth look at the ways in which this production takes place. Utilizing Mihaly Csikszentmihalyi’s notion of flow as applied to video games by Jenova Chen, Isbister explicates four distinct areas for designers to focus on when creating avatars for players: The player projects their self onto the avatar on the visceral level through building strength and skill, the cognitive level through understanding the reward loops and formal principles of the game’s rules, the social level in roleplaying and other imaginative aspects, and the fantasy level through the actual in-game task to task performance of the avatar’s operations on the three previous levels. Isbister argues that the “joining of player to virtual self through avatar-based action marks a core innovation that games have brought to media” (13). After grounding her research in the numerous relations formed through avatars and the physical representations of characters in video games, Isbister analyzes several games in terms of how they actually go about creating social emotion. First she examines multiplayer games such as the MMO City of Heroes and the way the designers give players flexibility in customizing their avatars’ powers, costumes, and backstory as ways of enabling visceral and social connections. After her analysis of multiplayer games, she looks at the recent trend of non-trivial body movement in games such as Wii Sports to look at the ways cognitive and visceral connections are enhanced through physical movement. As the screen reinforces a player’s movement, deeper connections are formed both with the in-game avatar and socially with other players in the same space. In this section, she also includes several examples of art games and other less well-known games that use movement in unique ways. Finally, Isbister ends her analysis by looking at the ways that social media and the connected nature of Internet-based play can be harnessed to create social emotions such as surprise, discovery, camaraderie, and pride. Throughout her analysis, Isbister emphasizes the fact that these systems and the emotions they elicit are intentionally designed, and that by analyzing the design, more effective systems can be created in the future. This is part of the book’s strength and weakness. Its arguments primarily target designers via how interplayer action and player-system interaction shape emotional response. Its literature review and scholarly genre largely targets academics. Because of this, it is hard to situate How Games Move Us amongst other texts in the field. While it shares the design-centric approach with other books in the Playful Thinking Series, such as Miguel Sicart’s focus on how to use design to elicit play in Play Matters or how certain rule systems foster risk in Michael Costikyan’s Uncertainty in Games, it also relies much more on scientific evidence to back its claims rather than only a philosophical framework for approaching game and play analysis. In this way, the book becomes a boon to humanities researchers who are searching for interdisciplinary scholarship to establish or support claims about how issues such as affect and identity function in games on a cognitive, neurological level. It also shares a common trait across the Playful Thinking Series in being incredibly readable. While it functions well as a scholarly text, its in-text citations never bog down the reader, and a thorough appendix of citations and endnotes accompanies each chapter for use in potential, future scholarship. Additionally, Isbister’s insistence on looking at a broad range of games means that the principles discussed by Isbister have a wide range of applicability from art games to AAA titles. While the book is an insightful read, it does little to advance its own arguments. How Games Move Us establishes its argument early on that games evoke particular emotions in ways other media cannot, but it never moves past this premise. The book admirably backs up this claim, but after the major intellectual work is done in the first forty pages, the remainder of the book is spent exploring how this looks in terms of game design. Part of the work Isbister tries to do in her book is to establish the legitimacy of games and their connection to emotion. However, this position would most likely already be accepted by any imagined readership, be it a humanities professor, neurobiology researcher or game designer. The book also fails to make a meaningful divide between digital and analog games and occasionally falls into the trap of associating particular elements or features to digital games when they more accurately apply to all games and forms of play. As one example, Isbister’s assertion that players are more able to strongly associate with characters that are made in a robust character customizer that allows the player to visually identify with an avatar does not account for the deep levels of attachment that are often found in pen and paper games such as Dungeons and Dragons or Pathfinder. This criticism becomes more than a trifling footnote because Isbister frequently includes non-traditional games such as Hit Me!, Ninja Shadow Warrior, and Yamove, which all require players to move through physical space and interact with other human beings in ways beyond the screen. The digital/analog divide becomes more apparent in these examples because Isbister frequently mentions that interaction here is structured in a futurist way that seeks to imagine digitally-enhanced games without the bounds of consoles and computers. While the examples are illuminating, they contradict the book’s beginning, which emphasizes the impact of avatar and visual appearance of characters as a primary way of achieving emotion in games. In this way, the book’s central argument becomes fractured and while all the parts stand up to rigorous analysis and a plethora of examples, they fail to become a unified whole. How Games Move Us is an excellent example of clear, concise scholarly writing and of the possible reach of such well-constructed books. While the text does not always see the ways in which it is at odds with itself, Isbister draws on the latest research–both her own and others–to establish clear ways in which the affective domain of games differs from other forms of media. In doing so, she opens up the conversation for vast swaths of researchers who call game studies home. From literature scholars to neuroscientists, Isbister is able to innovate for all.